Salem High School theater teacher Christa Vogt stood before a class of first-graders at Rosemont Forest Elementary School’s cafeteria March 26. Their response included enthusiastic hand-raising and nervous giggling. But it wasn’t the first time that Vogt had asked the same class that very same question. Flashback six weeks to Feb. 5, in the Rosemont Forest art classroom. 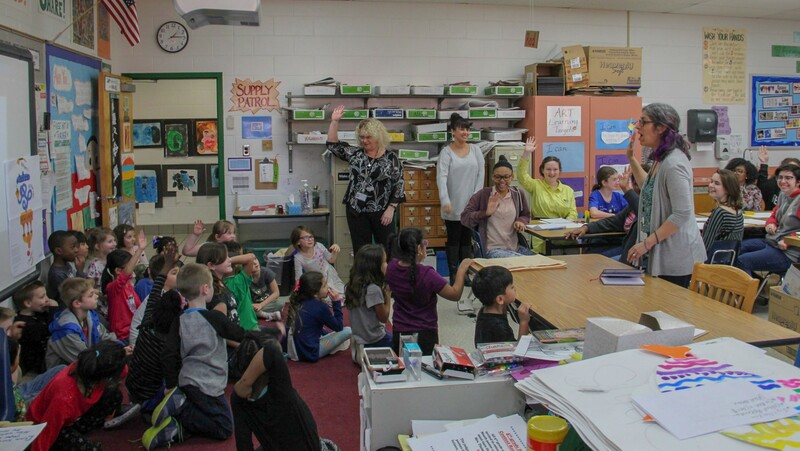 Vogt and the first-graders’ teacher, art specialist Pamela Thompson, stood before the eager learners just before they were introduced to Salem High School’s theater students. 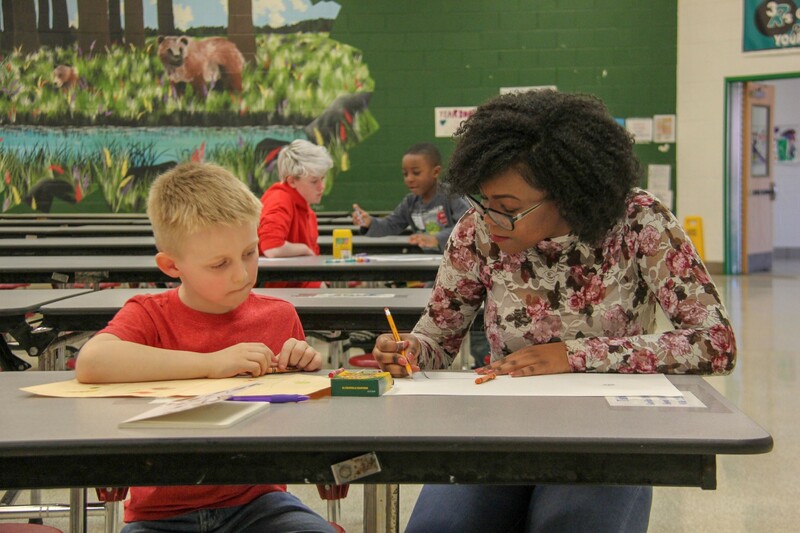 “WOOOOOOOOOOOW” was the reaction from the first-graders as the elder students were paired up with their young artists. 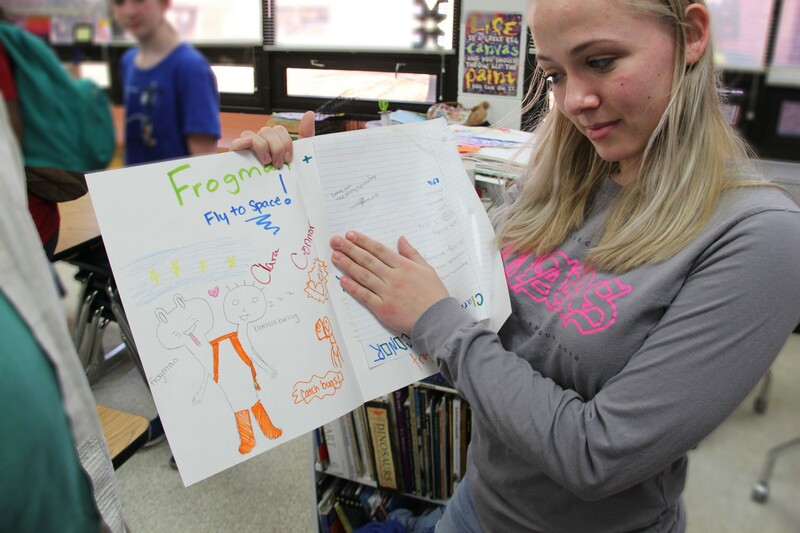 This project required the first-graders to draw their two-dimensional “personal creatures” and talk about themselves with their high school partners. 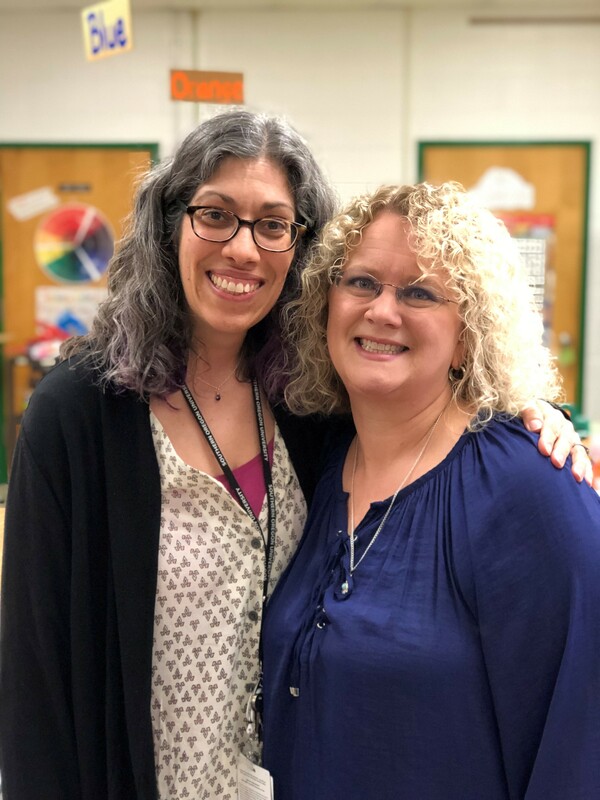 This collaboration was the brainstorm of Virginia Beach City Public Schools Fine Arts Coordinator Chris Buhner, who knew these veteran educators would work well together, despite the fact they had not met previously. Connor Land and Clara Synowiec were teamed-up with first-grader Ben Williams, and his creature was a bit more complicated. “Ben loves orange. LOVES orange,” Land said. 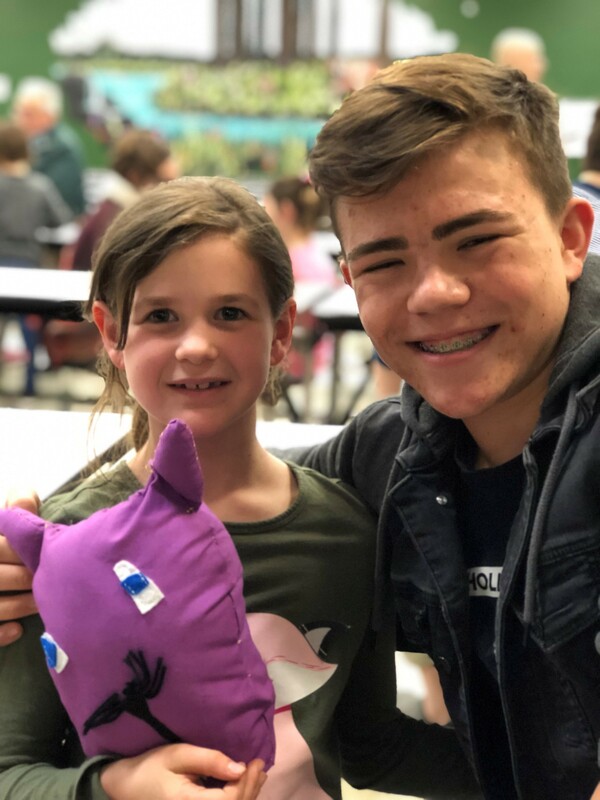 The theater students returned to Salem High School with the drawings and, over the weeks, created sewing patterns and built three dimensional toy sculptures based on them. Meantime, Vogt looped in her Acting Lab students and had them to come up with a short performance based on the sculptures. Which leads back to Rosemont Forest on a late March afternoon. 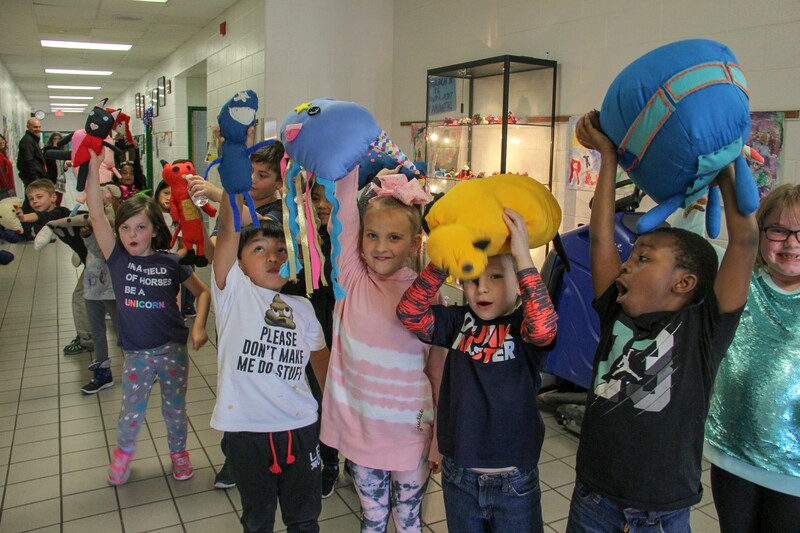 Following the performance that introduced each stuffed toy, high school students were reunited with their first-grade partners and officially presented their creatures. Squeals of delight were followed by hugs, laughter and chatting. Morgan Small confessed that creating Macy Springer’s cat Priscilla was not fun at first. “I need to go back to seventh grade and fix up my sewing skills,” he laughed. Vogt remarked that some of her students intended to continue sewing after this project. But the collaboration ended up being so much more for her class.